Jon Snow: Queen Daenerys of House Targaryen. My sister, Sansa Stark, the Lady of Winterfell. Daenerys Targaryen: Thank you for inviting us into your home, Lady Stark. The North is as beautiful as your brother claimed, as are you. 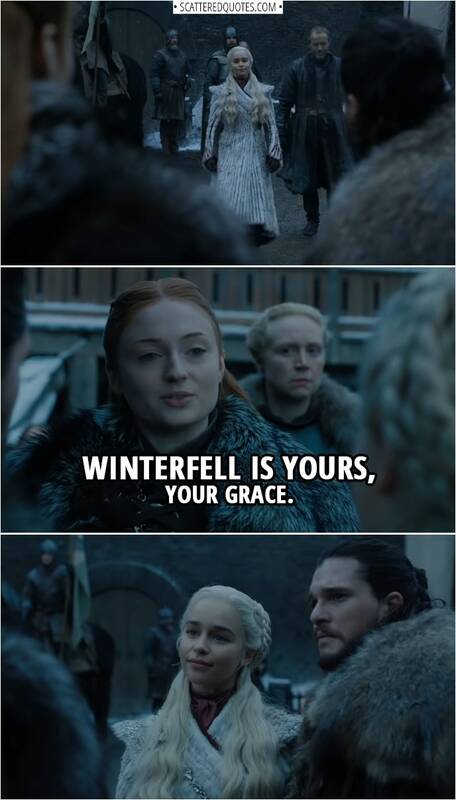 Sansa Stark: Winterfell is yours, Your Grace. Bran Stark: We don’t have time for all this. The Night King has your dragon. He’s one of them now. The Wall has fallen, the dead march south. 20.1.2019 Winterfell is yours, Your Grace.